Located at the heart of Mayfair this smart and intimate restaurant offers exclusive Lebanese cuisine. Complete with an exotic interior and hypnotic music Al Sultan offers authentic food in wonderful surroundings. From it�s central location, professional staff and high quality Lebanese cooking Al Sultan seems to have absolutely everything you would require for a business lunch, group meal or celebration with friends or colleagues. 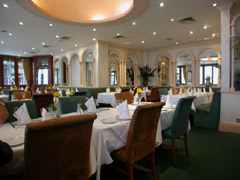 The restaurant can accommodate up to 60 guests and exclusive hire is available on request. Outdoor Seating is permitted but only in the summer weather permitting. After your meal, kick back, relax and follow the Arabic tradition and smoke on a shisha. Different flavours are available. The menu is extensive, with a vast selection of mezze that are beautifully prepared and presented. Try everything: hummus, falafel, arayes, fattoush or the daily specials. There�s a good choice of some excellent mains from the charcoal grill or fish section. Desserts are served from a trolley containing a haven of Lebanese sweets. Ah, i see. Well that's not too trciky at all!"